Seven works by Wolfgang Rihm – among them a world and a German première – will be performed at this year’s Musikfest Berlin. Keeping with the horn theme of the festival, Georg Friedrich Haas will as well be represented in Berlin with the performance of his concerto grosso No. 1. Find out more on Universal Edition. 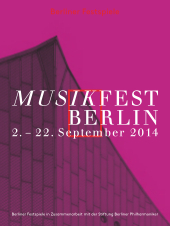 Read the full programme of the Musikfest Berlin.